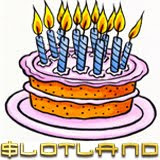 11 is the lucky number at Slotland.com this week as one of the internet’s first online casino’s celebrates its 11th birthday with random draws for $11, $111 and $1111 and an 11% bonus on every deposit October 1st to 7th. Both new and regular players will get birthday bonuses to mark the occasion. Beginning 1st October, new players will get an extra $10 credited to their accounts and regular players (that have deposited at least $50 prior to 1st September) will receive $50 free birthday money. The Slotland.com progressive jackpot is currently over $134K. Throughout its history, this jackpot has been well known not only for its frequency but its regularity. It is hit, on average, about every six weeks and the last big win was $80K on 14th July. Although it has gone to $200K, it seldom gets this high before it’s won. Sensing it has to be due for a win, a lot of regular Slotland players will be spending a few extra minutes at their favourite games next week hoping to be Slotland’s next six-figure winner. Slotland was a pioneer back in the early days of online casinos and was one of the first to offer real money casino games on mobile phones. By constantly developing new and better games, they’ve kept that pioneering spirit alive. The newest addition is the Reel Riot, a kitchy single payline game with stunningly animated traditional fruit machine symbols. Slotland.com currently features ten unique slot machines and five video poker games. Four of the most popular online slot machines and two video poker games are also available on mobile phones and PDAs. All of Slotland’s slot machines give players the option of placing a maximum bet for a chance at the progressive jackpot.